At the farmer’s market this weekend there was some beautiful organic okra and these sweet-hot red creole peppers, and I knew what I had to do. Gumbo! 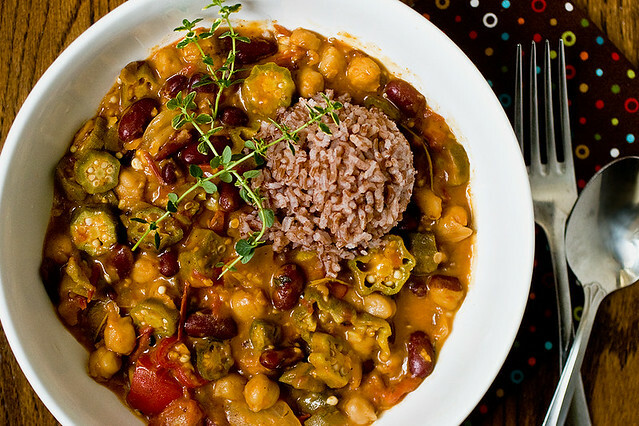 A thick and tangy stew filled to the brim with veggies straight from the garden and two kinds of beans. This is a great weeknight meal that is perfectly suited to my taste, because as I learned, that’s what gumbo is all about. A toasty roux, fresh tomatoes, plenty of onion and garlic, fresh thyme, and of course, okra. If you’re an okra newbie, or maybe just afraid to cook with it, this is a great recipe to start with. I use lots of veggie broth to thin the roux and cook the okra, and then reduce it with a long simmer, making for a thick velvety sauce that is not at all slimy. But let’s start from the beginning, because Southern cooking doesn’t come naturally to me. It’s not something I grew up with, besides maybe fried chicken, and I was probably in my twenties before I even ever had a po boy. There is a gumbo recipe in Veganomicon, and it’s delish, but that was all Terry. When I set out to make a recipe I’m not familiar with, I bury my face in my hundreds of cookbooks and just research, research, research. Sure, I’m not inventing a cure for any deadly diseases or creating a blueprint for world peace, but I do like to know a little bit about whatever I’m cooking. I bet there’s someone in New Orleans right now doing the same thing with matzoh ball soup! I started out thinking it kind of funny that a Brooklyn girl in Nebraska was making vegan gumbo, but I came to realize that it wasn’t really that weird. Gumbo is many things to many people, a mish mash of so many cultures, from African to French to Native American. In fact, with the exception of salt I couldn’t even find one ingredient that was absolutely integral to the dozens of gumbo recipes I pored over. I figured there would be something, like, say, celery, but not every recipe even had that. Same for thyme, or meat, or okra. All were common, but not common enough to say that gumbo has to contain them. So if I were an alien dropped from the sky onto earth for just one day and with just one mission — bring back gumbo intelligence — I would come away from it with a few understandings. Gumbo is a thickened stew with creole herbs and spices and lots of chunky stuff in it. It can be thickened with a roux, or with okra, or with file powder, and sometimes it’s a mix of all three. Most often, it’s served with rice. And of course I would have to report that it’s the official dish of the state of Louisiana! I used the creole peppers I picked up at the market, which are a nice sweet hot, similar to Italian red peppers. But use whatever not-spicy red pepper you can get. I also think that vegan sausages would be a great addition! Add them towards the end if you like. First we’re going to make a roux, but it has a little less fat than a traditional roux, which means it doesn’t get as goopy. If you’d like a more traditional roux, just add 3 more tablespoons of vegetable oil. Okay, so, let’s proceed. Preheat a large, heavy bottom pot over medium-low heat. The wider the pot the better, so that you have lots of surface area to make your roux. Add the oil and sprinkle in the flour. Use a wooden spatula to toss the flour in the oil, and stir pretty consistently for 3 to 4 minutes, until the flour is clumpy and toasty. Add the onion and salt, and toss to coat the onions completely in the flour mixture. As the onions release moisture, they will coat more and more. Cook this way for 5 minutes, stirring often. Add garlic and stir for 30 seconds or so. Add the peppers and tomatoes and cook down for about 10 more minutes. If using cherry tomatoes, place a cover on the pot to get them to cook faster and release moisture. As the tomatoes break down, the mixture should become thick and pasty. Season with fresh black pepper, add bay leaves, smoked paprika and thyme and mix well. Stream in the 2 1/2 cups vegetable broth, stirring constantly to prevent clumping. Add the okra and beans, then turn the heat up and cover to bring to a boil. Stir occasionally. Once boiling, reduce the heat to a simmer and let cook uncovered for 30 to 45 minutes, stirring occasionally, until the stew is nicely thickened and the okra is tender. If it’s too thick, thin with up to 1/2 cup vegetable broth. If it’s not as thick as you like, just cook it a bit longer. Add the lemon juice, and adjust salt and pepper to your liking. Let it sit for 10 minutes. Remove bay leaves and thyme stems (if you can see them) then serve in a big, wide bowl, topped with a scoop of rice and garnished with fresh thyme. Yummy – this Southern Girl thinks that sounds delicious and look awesome. I’ll have to print this one and try it when the weather cools off. I realize this is called “Okra gumbo” but…I (very strongly) do not like okra. What is a good substitute? this looks delicious. I live in Kenya and have never had gumbo, so would be an excellent way to try it. I can’t easily find smoked paprika here, can i just substitute it with sweet paprika? omg.. that looks sooo good. I was born and reared in the American South, and have my own recipe for gumbo that I’ve made for years. I’ve always believed that the definition for gumbo was a roux-based stew containing okra as its staple ingredient. You can put whatever else you like in it, but if it ain’t got okra, it ain’t gumbo. I would respectfully suggest that if commenter Juan doesn’t like okra, he should avoid making or eating gumbo. Substituting this component is strongly contraindicated. That said, I made this recipe last night and it turned out quite well. I added some zucchini since they are coming out of my ears at the moment, and subbed cannellinis for kidneys as that’s all I had on hand. I crumbled up a seitan sausage, used frozen okra since growing that wonderful weed in the Pacific Northwest is more difficult than the weather will allow, and threw in a bunch of other random peppers I had from the garden. That’s a great thing about gumbo – you can use whatever you have on hand, and it isn’t the kind of dish that you should fuss over too much to get exactly like the recipe says. I don’t think I’ve ever made gumbo the same way twice, and that’s as it should be. It all came out tasting great! Well done, Isa. The chickpeas are a novel addition that I don’t think I’ve seen in other gumbo preparations before, but it works. Oh my! This looks lovely. I haven’t cooked with okra myself, but I have a reason to now! Smoked paprika is also not a standard spice in grocery stores in Germany, at least not in the region where I live and shop. I think I’ll just substitute a pinch of chipotle powder (to get the smokiness) mixed with one and a half teaspoons of Hungarian paprika or sweet paprika. Or just use regular paprika and add a few drops of liquid smoke to the gumbo. Do you think that might work or would it alter the taste too much? I think that any of those ideas would be just great. This looks mouthwatering! I have never had okra gumbo before and I am totally tempted with those photos. Looks awesome! I’ve never had gumbo, but this makes me want to try it. Thanks! Yay a vegan gumbo! I’m going to try this when I get some home grown okra from my dad. Thanks for posting it. We had this for dinner tonight and it was awesome. I used white northern beans instead of the chickpeas. My boyfriend’s parents gave us okra from their garden last weekend. Our favorite way to eat okra is to steam it in the microwave, then put some Earth Balance and salt on it. That only works well for the small stuff, though. This gumbo was a great use for the larger okra that they gave us. As a displaced Southern Girl in a land where fall has already turned, I’m DELIGHTED to try this! They just start putting okra out in my Farmer’s Market! Made this & served at a party yesterday. It was a hit, especially with the black Forbidden rice that we served with it. It was challenging but fun finding okra, this late in the summer. Hello, Asian market! Thanks for the recipe! made this for dinner the other night and it turned out great! didn’t really make any changes to the recipe- just served it w/ jasmine rice. yum! Made this a few days ago. As a non-vegan, I have to say that I liked it, and that it is a fair substitution for gumbo; however, it fell a little short for me because it seemed like other than meat/seafood, something was definitely missing. Maybe celery? Parsley? I’m going to try it again with these two additions. 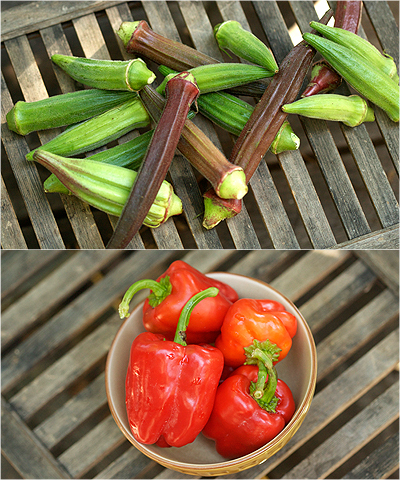 Funny: I made gumbo the other night, with black-eyed peas plus hominy and sweet corn, because I’d just found some amazing looking okra and couldn’t resist this strange new vegetable. Guess you really can tell it’s cooler out now, hey? So making this this coming weekend! Just wanted to let you know I made this last night, and it was SO GOOD. I added some roasted green chile for some spice, and used twice the kidney beans, instead of garbanzo. This is definitely going to be one of our regular go-to dinners now. Thanks!! I saw fresh okra at my local farmer’s market the other day and figured it was calling me to make this gumbo. I just finished eating it and it was delicious. I subbed black beans for kidney beans because it was all i had on stock and it worked out well. Thanks for the recipe. Oh, man! I tried okra for the first time using this recipe, and I really, really loved it. Thanks a bunch! Woww! Just got okra from our South Central Farmers’ Cooperative CSA box and found this recipe…ate it for dinner and am going to eat it for lunch and share it with friends and pass along the recipe! Everything was PERFECT. This looks delicious. Do you think it could be made in a crock pot? I just bought one and haven’t had any ideas of what to make it in yet! The African word for okra is “gumbo” . It was introduced to this country in New Orleans . No need to call it “Okra Gumbo”, the name gumbo is just fine. Excellent recipe, but you must include the Trinity , green bell peppers,onion,and celery, and the trio of white pepper,black pepper and cayenne pepper. I want to thank you for this recipe. It turned out absolutely perfect. Nothing else to add. I’ve made this dish probably 6 times since i came across your recipe. Thanks a lot. Absolutely delicious! I’ve recently been going wild cooking Southern food and this recipe was a perfect addition to my latest craze 😀 Good work, Isa! I subbed purple peppers (because they were locally grown and cheaper) and added a delicious Chipotle vegan sausage. There are so many ways to play around with this recipe I have a feeling every time I make it, it’ll be slightly different. Great recipe! I was disappointed that fresh okra was not in stock at my local grocery store so I had to make do with frozen. I think next time I’ll sub the kidney beans for 1.5 cups sweet potato or sausage. I was tempted to add some soyrizo, but I feared that would alter the taste of the dish too much. Just made this, and it´s great! First time making gumbo, roux and all. I live in Spain, where okra is not at all popular, most people have never heard of it. But I found it at a Chinese market! Instead of rice, I served it with millet, very good. sooo delicious! …and worked out perfectly b/c i got caught up in a moment and bought a bunch of okra at the farmer’s market on a whim and had no idea what to do with it. thanks isa for another awesome recipe! Also, I meant to add that I am gluten free, so I used an all purpose gluten free flour blend and it worked just fine. Next time I think I will try a healthy flour, like chick pea flour, and see what happens! Speaking as someone from Louisiana, gumbo, though meaing okra in the original language from the slaves, is not always in gumbo down here. I have eaten many gumbos without it. Most gumbos I’ve had do have the “trinity” though(onion,bell pepper, and celery). This looks like a good recipes and I would like to try it adding in the other two of the “trinity”. wow, just cooking the last steps now – this is unbelievable. makes a cold wet day in London almost bearable. i miss the states and the south so bad. gonna try to find a bottle of dixie or atiba somewhere in this country to make the dish complete. cooking it right now 🙂 i’m excited how it’ll taste. i’ve put it in the pressure cooker because i wasn’t able to get cooked chickpeas, just dried. ocras get less slimy if you wash them in vinegar – i used fruit vinegar for a sweeter taste. Funny… my whole family is French/Creole from Baton Rouge, but I have never heard of a “Creole Pepper”!! Haha, isn’t that how it always is? This is so flipping delicious. I don’t want to single anyone out, but I’m pretty sure it’s the smoked paprika that sealed the deal on me wanting another heaping bowl right now. I made this last night, it’s phenomenal! I couldn’t find smoked paprika, so I settled for regular paprika and it’s still great. Thank you so much for posting! Please continue to post more delicious, nutritious vegetarian/vegan meals! Just made this. It’s amazing. Turned out great. First time cooking something of your website, and I look forward to my next creation. Thanks for the awesome recipes. I am proud to say that I pulled this recipe off. (Or at least I think I did.) Very hearty dish, I love it! Love all of your cookbooks and recipes, you have never steered me wrong Isa. Made this for dinner tonight, holy crap this was super easy and incredible! Sounds delicious. i’ve only made gumbo once before (with chicken) but I would love to try a vegetarian one! Simmering roux is one of those “smells” from my childhood. As far as the ingredients go, I think it depends on which side of the state you’re eating your gumbo in (we rarely had okra but if you tell my mom you’re making a roux out of anything besides shortening and flour, she’ll knock you on your feet). My dad is from the “heel” of Louisiana and his mother taught my mom how to make all the creole/cajun staples he ate growing up. She said that there are as many ways to make gumbo as there are people in Louisiana (but only hers was the right way, of course). As a girl who grew up eating gumbo, I’m itchin’ to try this. There were rarely any veggies in our gumbo growing up besides green onions… just rice, roux, and meat (shrimp or chicken, none of that mixing meats nonsense in our house) so this will be a nice experiment and if I’m halfway pleased, I may even try taking it home to mom and dad some time. Thanks! This is amazing. So amazing I made it in the summer. Yum! This is FANTASTIC! I didn’t have smoked paprika and just used regular, it was just fine like that. Great recipe! I picked up some fresh okra on a whim, and made this. It was amazing! I have never cooked with okra before, and haven’t eaten it since I was a little. This gumbo is absolutely delicious. I didn’t have any fresh thyme, so I used dried. I didn’t have smoked paprika, so I used sweet but added a few drops of liquid smoke. I have some okra left over, and I’m thinking of just making a second pot of this gumbo, instead of trying anything else new! I am obsessed with gumbo… mostly the okra, and the spices, and have been looking for a good vegetarian option. I just made this and it was quite delicious!! Nice work!! I just didn’t add any rice, and added some gumbo file. You’ve inspired me to try it so many different ways now! Great gumbo! I just made it and can confirm it’s a good one. I added 1/4 teaspoon of cayenne pepper to give it a bit of kick and didn’t have any canned (or soaked) kidney beans but it worked fine without them. Yum yum! Thanks! This is so good! I cooked it tonight and added soy crumbles and nori! Yummm. Delish. Very easy. Sliced frozen okra made the recipe even easier. Celery and mushrooms were nice additions, and I am sure zucchini would be too. Thanks!!! Deelish! Used frozen okra, canned tomatoes, & skipped bell pepper all together! My non vegan 10 year old & her best friend ate 2 bowls each! This looks awesome and I am itching to try it out. There is some great vegan chorizo they sell here that will go perfectly I think. For the historic factor, it may be of interest to know that the French word for Okra is ‘gombo’. The vegetable was introduced to the French by African slaves who brought it with them to the French Antilles and grew it (it is originally from India), so probably that is where it came from in the south as well. So I would agree with a couple of others that if it ain’t got okra it ain’t gumbo. One could even say that “Okra gumbo” is a redundant term – just saying the same thing in 2 languages. 🙂 I came across this because I am trying to figure out where I can find okra here in France, and now I know if I go to African specialty markets I can find it. I made this last night and I really loved it! It’s a very hearty dish. I added some vegan chorizo and it was dyn-o-mite. I do have a question though–just out of curiosity because I’m trying to understand how to throw recipes together–what is the purpose of the lemon juice at the end? 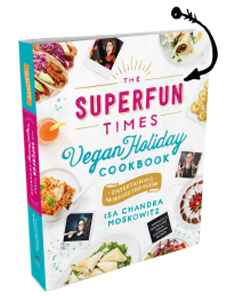 Your recipes have enabled me to cook scrumptious vegan stuff for years Isa. I’m so appreciative! Made this several times and became a very happy girl. Flipping awesome!!!! It had great rich flavor. Hubby and I both loved it. I didn’t have okra (which always makes me think of Oprah) but I threw in some extra flour and green beans instead (got the green bean idea from a substitute list for okra). Also threw in some vegan sausage. Yum yum yum!!! The Okra Principle | lights cancer action! Does anyone have an nutritional facts for this? I roughly followed this recipe – had to make a few substitutions and I didn’t measure anything. It came out beautiful and really delicious. I never thought of using beans in a gumbo. Sadly I have a capsicum (bell pepper) allergy; any suggestions for a suitable substitute? I’ve got some okra and would love to make this recipe! Thanks! I made this today, and it got me to thinking: what’s the deal with roux? I know a traditional Roux is made by cooking flour in a fat/oil until it’s toasted and deeply brown. It serves as a thickener, and to add color & flavor. I don’t use oil in cooking anymore, so I just toasted flour in a cast iron skillet until lightly browned, and used that as a thickener, in broth instead of oil. It turned out wonderfully. Does a traditional Roux cooked in fat add anything to a dish (besides the properties of the fat, aka taste & texture) that plain old flour or toasted flour would not? I can’t think of anything. So why do traditional recipes bother with all the work making a roux in the first place? And let me say prophylactically that I know what I did is NOT a real roux, and no offense meant to those with deeply held roux opinions! Just take it as a given that I enjoy the whole foods, plant-based way of eating, and just wanted to come as close to authentic as I could within those parameters. Thanks! I made this lastnight and it was delicious! Yep – this works just fine. I am trying to cut way back on my food bill since I do a lot of running around, and I’m also trying to eat better in general. This recipe suits both bills, and it’s way tasty too! Made this recipe last week, and it was delicious. I love Okra. I favor gumbo with sassafras or file powder instead of the flour due to wheat intolerance. But this recipe was impressive and full of flavor. I used gluten free flour. What size pot would be best to use?